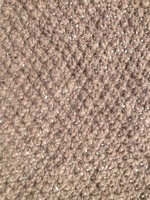 And this is what makes it a very boring knit. I haven’t any proper project photographs but there have been activities. 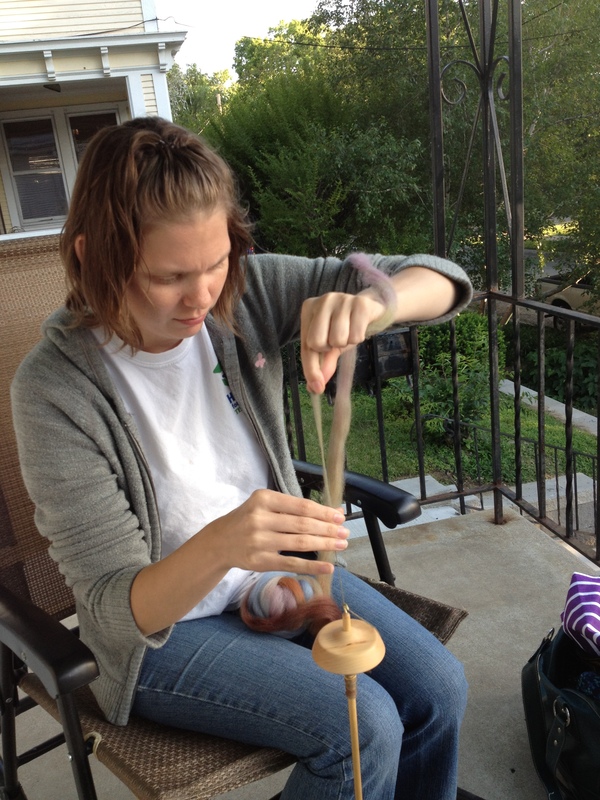 Last evening I spent the evening spinning on my porch with two spindle spinners. Despite the fact that my porch is lethal for spindles, we had a very relaxing evening. I snapped a quick shot of my friend sparkeespud in action as it is such a novelty to see a spindle in my life. On memorial day we had an extremely relaxing day hanging out in the sprinkler catching some much needed sun. 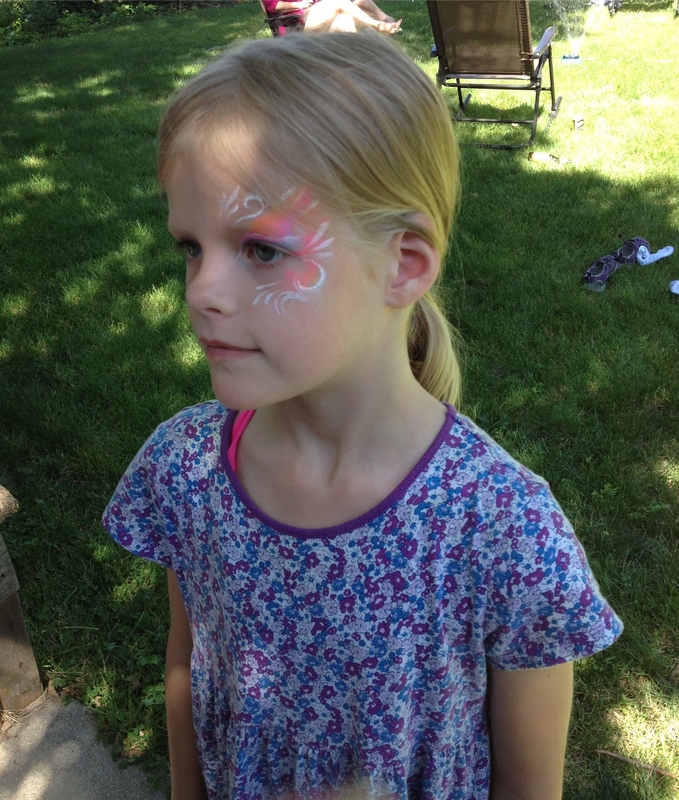 Bug was dropped off by her dad with a lovely face painting so I took the opportunity to snap a picture of it, as well as a few others that made the day memorable. And finally, the past few weeks have been less about crafting and biking and a whole lot more about cooking and eating. Perhaps this is, in part, an attempt to find balance? All I can really say about that at this point is that I really should be taking more food pictures! 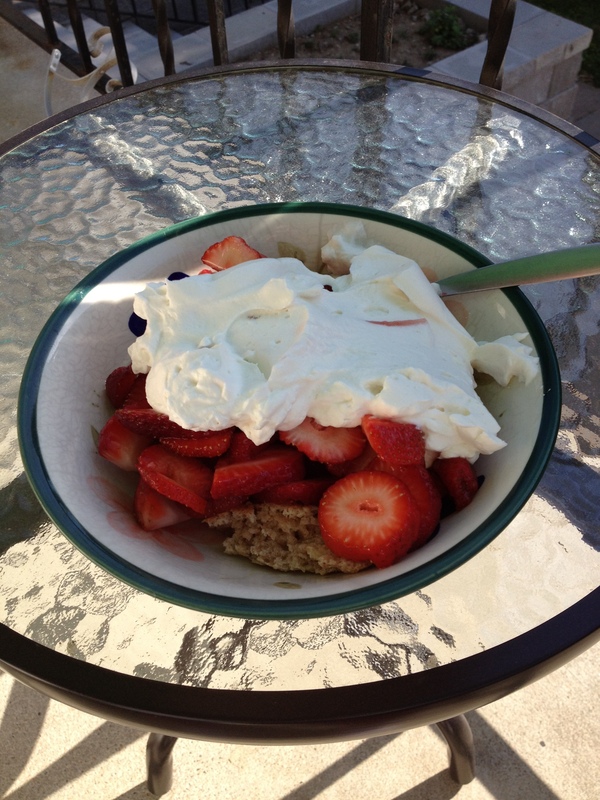 I had to use up some strawberries yesterday as they were going bad too quickly, so Bug and I had strawberry shortcake on the porch. A fine summer treat. This weekend has been good for my soul. I’ve done very little crafting, very little biking, very little of anything blogworthy at all. Though there has been food, so much good food! I finished my sock yarn rug on Friday and just had time to soak it on the porch before leaving for an evening with my friends. It took all of Saturday and right into Sunday to dry, but this morning I was able to cut back the many many ends and snap a photo. I absolutely LOVE this thing! It is so pretty and I love how the colors change and chase each other. Most of all, I love that I can see my knitting history in it. There is handspun, and socks I knit for all my loved ones, and socks I knit for me, yarn from so many projects over the years. I have more yarn I’ve saved aside because Bug wants one for her room. I told her she cannot have one for her room until the room gets cleaned out again. I am not sure if I have enough to make a very large one, but I did save the more girly colors for her so she can have what she wants. In other crafty news, I picked up the sweater I am knitting from the yarn from my first fleece again yesterday. I hate that I am at a point where I am knitting such boring seed stitch sleeves. If I can power through that, the rest of the sweater should be fantastic. While today will be predominately for cleaning up the yard and running errands, I may be able to get the last bit of my corriedale fleece flick carded. I plan to begin the drum carding process tomorrow, so it would be nice to start with an entire fleece rather than move back and forth between two projects for the same fleece. In the end, my craft focus lately has been spinning related rather than knitting related. It doesn’t make for great blog posts. We will see what happens in this upcoming week. You all know I love the striping sock yarn! And I got some short striping Regia in a trade. I decided the most basic patterns show off the best stripes, so I decided on my favorite Gentleman’s Plain Winter Socks with a short row heel for myself. I have finished the first sock, and am halfway down the leg of the second. They do not match, but I do not think this will be overly noticeable. Bug and I had the rare and very relaxing opportunity to spend the day at a lake on Saturday. I could not resist taking my wheel, as well as a fleece that needed to be flick carded. While there, I was able to finish spinning some gorgeous dyed merino I had in my stash. We returned home from the lake rather early because there were storms rolling in, so I decided to spend the evening on my porch plying and watching the storms. It was a beautiful evening and so productive. Not to mention the entire day was something that my soul needed. At the end of the day, I had 177 yards of bulky yarn. 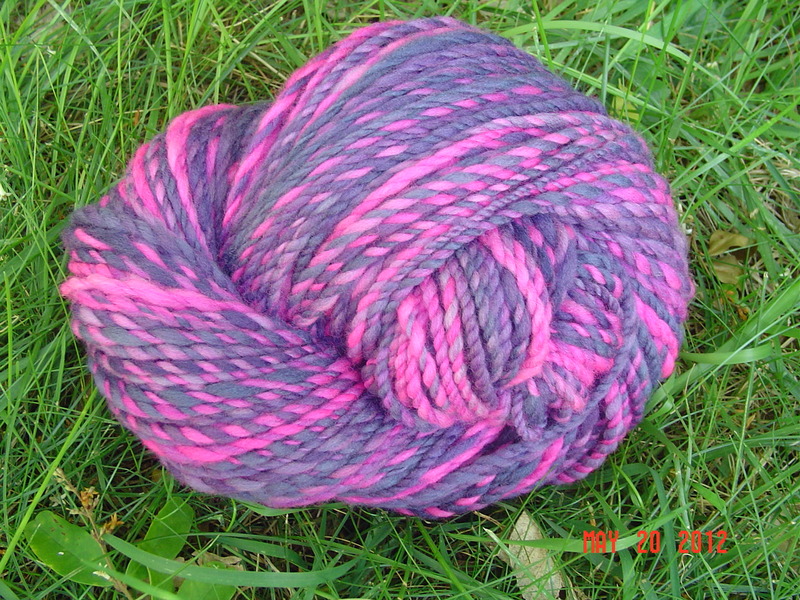 Beautiful, rich, bright, soft, bulky yarn. To say I have been rather uninspired knitting wise would be an understatement. I’ve been busy biking, and when not biking, I want to crochet. At some point last weekend I realized I had exactly a week to start and finish and wash and block a baby sweater. This was a little stressful, but I knit fast so the only real issue would be not riding my bike often enough to complete it. I completed the sweater Friday night, and blocked it. This morning we took Bug on a bike ride, then went out for breakfast. While there, I got a phone call saying “The baby shower has been canceled on account of the baby deciding to make an appearance today.” So all that quick work was not entirely necessary. 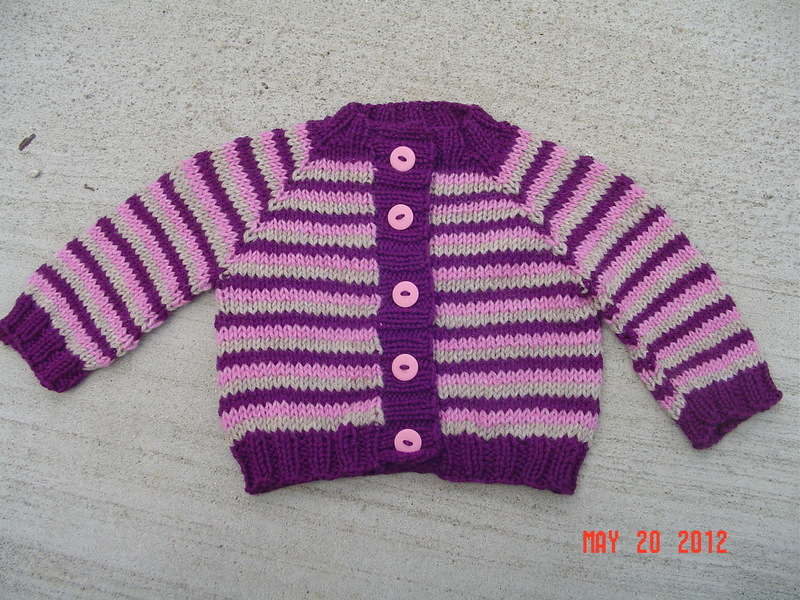 However, I still think this lovely striped sweater will be fun to hand over to the new owner. The sweater pattern is Little Coffee Bean cardigan. 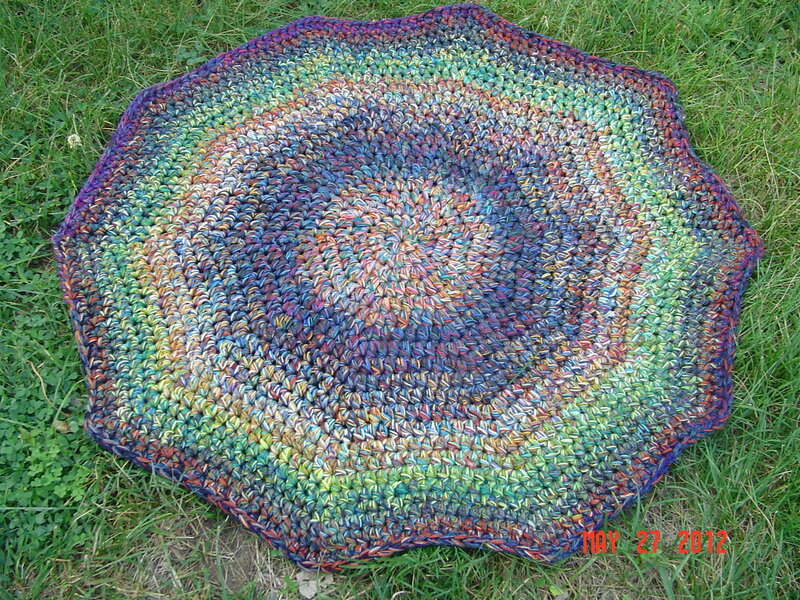 I used 3 colors instead of 2, all cascade 220 that I happened to have in my stash. I’ve decided to do another along the same theme, because I think the colors are just that stunning together. Lots of riding, slow on the knitting front. Actually, I’d say I got enough time for crafting this weekend, but most of it was spent flick carding a fleece, rather than actual knitting. 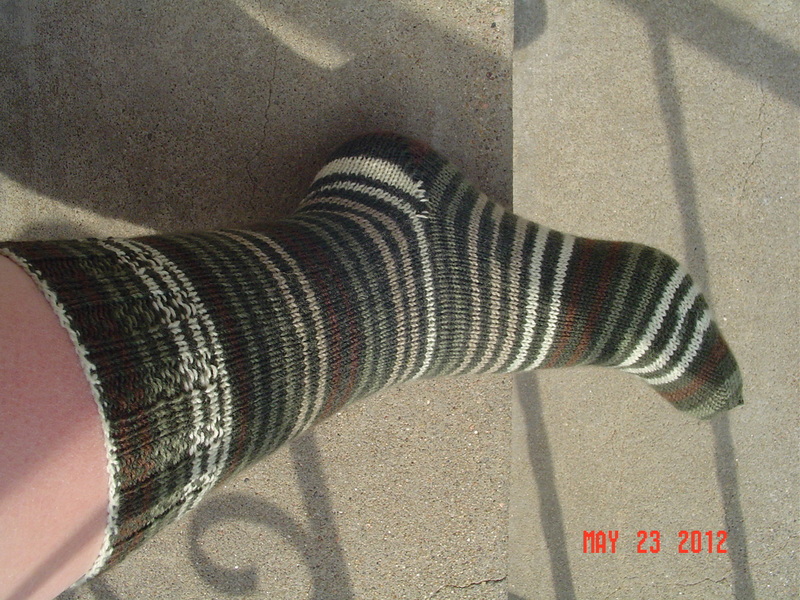 Now, while this particular sock is actually complete, I don’t have time to photograph it so you get the picture from the other day. Quite frankly, I love love love the short stripes on this! I did a short row heel on this just because I haven’t done one in ages. It does help with the stripes as well. 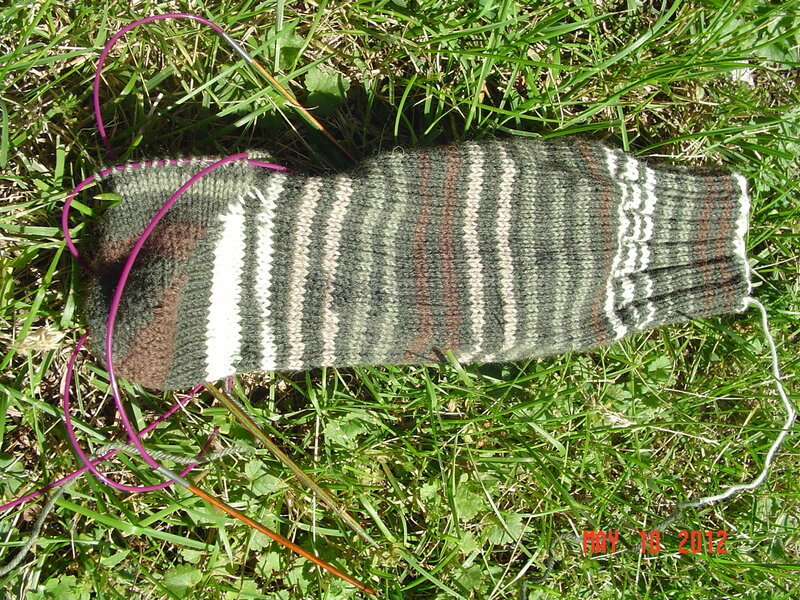 If we are lucky, maybe there will be a picture tomorrow of the finished sock.